From March 1st till April 7th, 2018 “Beautiful Smartphones for the Most Beautiful” promo is launched in all Ucom sales and service centers. 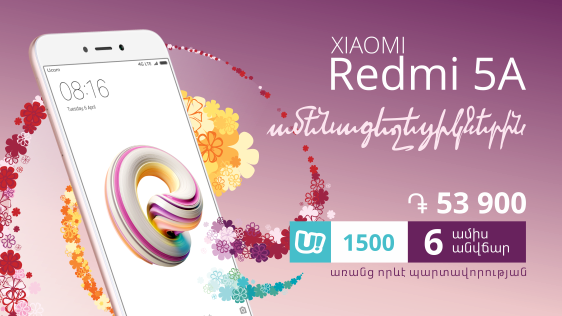 All those, who wish to test the quality of the fastest mobile network in the evaluation of SpeedTest, have the opportunity to buy stylish smartphones with HD display, double SIM-card and 4G+ possibility, and get the monthly inclusions of U!1500 Prepaid tariff plan for free during the period of 6 months. In particular, the Fly Champ smartphone can be acquired at the rate of 33 500 drams, while the Xiaomi Redmi 5A smartphone for 53 900 drams only. The purchase can also be done online at the Ucom eshop, by paying online or in cash at the delivery of the purchase. «Our new customers will get 1,5 GB of mobile internet, 100 minutes to call all local networks and Artsakh for free during 6 months. Moreover, upon consumption of those minutes the subscribers will be able to call unlimitedly within Ucom mobile network», said Hayk Yesayan, Director General at Ucom. There is an official 1-year warranty for the smartphones being sold within the frames of the promo, as well as an additional 1-year free post-warranty service in case the smartphones were acquired via Ucom eshop. Let us add, that the quantity of the smartphones is limited.